Virginia Burt of Virginia Burt Designs delivered a talk at the 2015 annual meeting of the American Society of Landscape Architects held this year in Chicago on November 7th. Joining Cornelia Hahn Oberlander FCSLA, FASLA on the stage, Virginia and Ms. Oberlander spoke for 90 minutes on creating and implementing landscape architectural designs within coastal and arctic climates. They emphasized that good design acknowledges and works within the often sensitive local ecological conditions of these areas so that the landscapes may thrive and adapt to climate change. 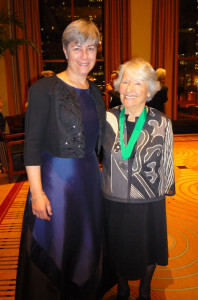 Both Virginia and Ms. Oberlander, who has practiced landscape architecture for more than sixty years and holds the medal for the Order of Canada (1990), urged the emerging and seasoned landscape architects in the audience to become leaders in the battle against climate change through smart and sensitive design. Virginia Burt, FCSLA, ASLA, RLA creates landscapes and gardens of meaning for residential clients, healthcare facilities, and unique special projects. Her love of the land has been a lifetime journey. Having grown up on an apple farm, she developed a passion for being outside and understanding the rhythms of nature. Virginia graduated with honours in landscape architecture from the University of Guelph in 1985 and worked in offices in Aspen, CO and Toronto, ON before starting her own firm, Virginia Burt Designs, in 1996. For over 30 years, Virginia’s international award winning work has been recognized in the design of healing gardens, labyrinths and sacred spaces. She was recently awarded a national CSLA Award of Merit in 2015 and a 2014 Palladio Award in the USA and has been published in numerous magazines and has presented at over 200 conferences across North America. Virginia’s design work reflects her roots, creating gardens and landscapes that reveal their natural context and reflect those who use them. Clients appreciate and value her deep respect for place and for the human dimensions of each project. Virginia gets things built – beautifully.